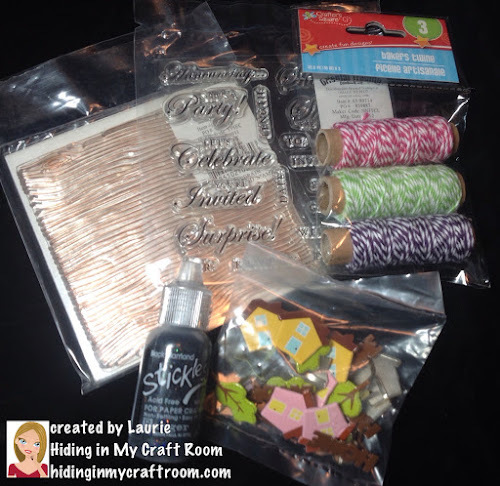 Hiding in My Craft Room: Giveaway #7 of 12 Days of Giveaways! Today's giveaways is a fun little bundle of crafty goodies! A couple of clear stamp sets, Black Diamond Stickles, some fun brads, and baker's twine! To get entered into this fun bundle all you need to do is leave one comment on this post! Today let's share your favorite time to craft! Are you an early riser or a night owl or are you one of the lucky ones that can find time during the day!? I can sometimes craft during the day if my newly turned 5 year old lets me! LOL!! He will be in kindergarten next year so I have to enjoy our remaining days together. So most of the time, especially since my husband's deployment, I am crafting late at night. I'm definitely not an early riser. But maybe that's because I'm always doing things at night! Which came first! Who knows! Good luck and be sure and check back to see our new challenge in the morning! And our new giveaways each day! We have 5 more! Favorite time is when there is day-light coming from my crafting room window. So in winter it is somewhere from noon to to 2-3 pm. That is when I get my mood on. Hi! My favorite time to craft is late at night and in the weekend and whenever my 3 years old daughter lets me! Thank you so much for this fantastic giveaway and for your great generosity! I love crafting during the day when it's quiet and everyone is in school. I am focus better on what I am doing. My favorite time of the day to craft is first thing in the morning and then later in the evening. And, if I don't have to work and I'm by myself I like to craft then too! thanks for the chance to win! My fave time is whenever I can carve out some time!! lol.. But usually early in the day, especially when little miss is at school. I like to craft anytime that I don't have to plan lessons or grade papers! I craft whenever! !Early to bed,early to raise!!! My 'favorite' time to craft is mid-morning. I am fresh, energized and most creative then. Unfortunately, they like me to show up at work on time so that is not when I do it. I fit it in any time I can, generally at night ... late. I usually craft in the afternoon. Thanks for the chance to win. Usually craft in morn before & after I have walked my dog Daisy and before & after I watch my fav soap Young & Restless Y & R. All crafting stops while I watch my soap Y & R.
Thank you so much for this awesome giveaway of crafty goodies!! I consider my self an early riser but when I am home alone I love to craft in the evening til night.. Mid morning - thanks for the chance to win!!! Woohoo, I love today's prize! This one has my name on it for sure! As for favourite time to craft, it's any time in between my household chores. I am no longer able to work due to health issues so my schedule is my own but it depends on the state of my health on any given day. I have good days and bad. Thank you for all of the generous giveaways - I am super excited about this one! I'm retired so I can scrap anytime the grandkids aren't visiting. I love to scrap in the morning. I tend to have my most energy, motivation, and creativity early in the day. My favorite time to craft is the afternoon, when my 2 year old is napping and the 5 year old is in quiet time. That's the time I have some free time and I have to be really organized so I make use of it! Otherwise I sometimes craft in the afternoon on a weekend when my husband watches the girls. Either way, it's the middle of the day when I'm most creative. Thank you for the chance to win this great giveaway ! I usually craft in the evening. My Explore is in the den, next to the family room. So sometimes I make my cuts, get my papers ready, and then take it all into the family room to assemble while watching evening tv with my husband. But here it is Saturday morning close to lunch, and I am still in my pjs and crafting and reading emails. I just love to craft anytime!!! My favorite time is a rainy day when husband is at work. I'd prefer to craft in the morning, but life and family sometimes takes over. I tend to do my best scrapping at night when everyone is watching tv or sleeping. My favorite time to craft is afternoon. Thanks for the chance at winning these awesome goodies! My favorite time to craft is at night. I'm a real night owl and got into the habit of crafting at night when my kids were small, because that was the only time I had free! I usually start crafting at about 10:00 pm and have been known to still be up when the newspaper is delivered in the morning!! When my twins were little and still taking naps, I started having my "quiet time" during their afternoon naptime. Now that they are older (and I homeschool), I still take that afternoon naptime to be my crafting time. Thanks for the chance to win. I love crafting early in the morning. I would rather go to bed early to wake up early. I'm a last minute crafter so depending on the project, I may go on till late night. Rather than a specific portion of the day, I like to craft whenever I want/need to relax, or feel a sense of accomplishment. What a wonderful bundle of crafty goodies. Thank you very much for the chance! I rarely craft in the morning. Sometimes I do in the afternoons. But my best creative times are in the evening and even into the wee hours! If it is getting light, I know I have stayed up too late....esp in the winter! Ha. I am like my crafty friend, Karen, as far as night-owlishness! Thank you for this sweet bundle of goodies for a giveaway!!! I like to craft early in the morning when I am alert and still have time to run to the store in case I mess up or run out of something. I craft whenever I can find time. Working full time cuts time down some for sure. I usually bring some of my crafty stuff and play during my lunch break. I craft at night after the kiddos are in bed. I only get up early because I HAVE to get the older two off to school.